CBC North Asks: How have families been affected by residential schools? 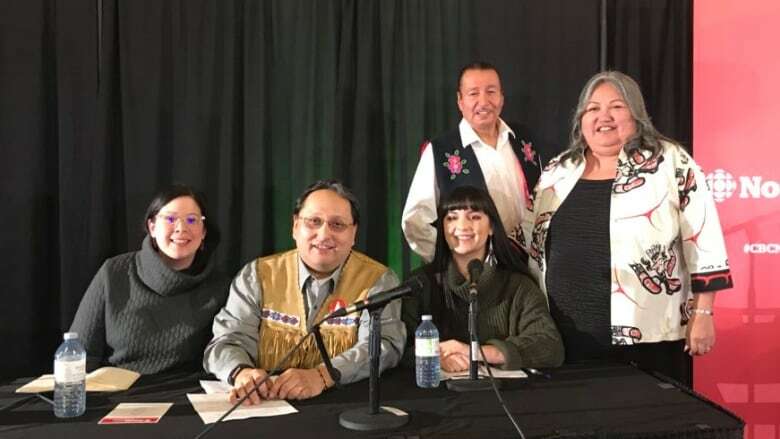 CBC hosted a live panel discussion in Whitehorse on Thursday evening, to explore how the impacts of residential schools are passed down through generations. CBC North hosted a live panel discussion on Thursday evening, exploring the lasting impacts of residential schools on Indigenous families and communities. Many children of former residential school students have spoken to CBC North this week about their lives, and the struggles they've faced as victims of intergenerational trauma. Sharon Shorty, a Whitehorse-based performer, hosted Thursday's discussion at the Kwanlin Dun Cultural Centre. Shorty's parents and many other family members attended residential schools in Yukon, B.C., and Alberta. Joe Migwans, a cultural counsellor for First Nations men and families. Teagyn Vallevand, from Youth for Lateral Kindness. Davida Wood, manager of First Nations Initiatives at Yukon College. Mark Rutledge, an Anishnabe survivor of the Sixties Scoop.